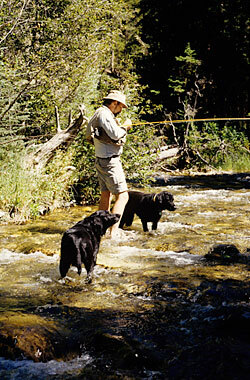 The author fishing with his dog. EVEN THOUGH I live in a lightly populated state in the Rockies, a lot of my strategy as a trout guide is not about the traditional fishing skills of reading water and fly selection and presentation. Instead, it revolves around dealing with fishing pressure—finding less-fished water, picking a stretch of river or scheduling the day to avoid as many other anglers as possible, figuring out how to get a fish who has seen too many flies to eat the one at the end of my client’s tippet. We all dream about the days our grandfathers enjoyed, fishing for unsophisticated quarry, with the beauty of nature and wildlife as our only companions. But unless we travel to far-flung corners of the earth or have the means to buy our own private chunk of it, this experience is becoming harder and harder to find. For many of us, the best chance to get away from our fellow anglers, even for a day, is to throw away our favorite “what rock to stand on” statewide fishing guides, ignore the latest updates on the fly shop websites and strike off on a bluelining adventure. Bluelining involves finding those little blue lines on a map that mark obscure (and hopefully, unfished or lightly fished) small streams—and then figuring out how to get there. On the trail, be sure to carry water. 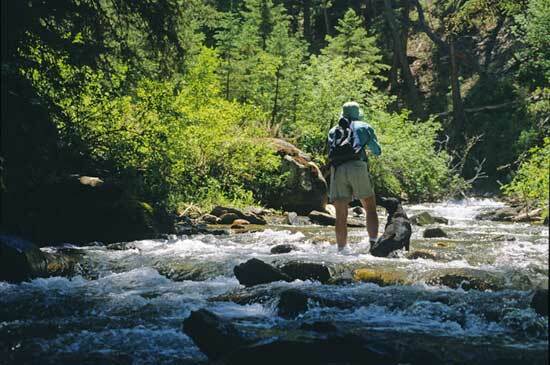 You might be tempted to drink the water out of seemingly pristine mountain creeks, but talk to someone who has suffered through a bout of giardia, and you’ll change your mind. Bring a compass—but only if you know how to use it in conjunction with your map. If the highest priority on your fishing vacation is to catch a fish as long as your arm, then bluelining is not for you. You’ll probably need to make plans to join a whole bunch of folks on a famous tailwater to make that dream come true. But if you are willing to trade the chance at that picture fish for a quiet day in beautiful surroundings, with few fellow anglers around, using simple but classic fishing techniques, then start finding and studying maps now and have an adventure this season.